Ultra-Tech uses a fairly conventional classification of weapons, putting SMGs (which it defines as 10mm full-bore pistol rounds from a rifle-shaped platform) and PDWs in one group . . . but classifying short-barreled rifles, the carbine family, along with rifles. There’s functionally a limited difference between the three weapons in terms of size, ergonomics, and utility. The three weapons all focus on being compact and having a large number of shots. Some of the performance of ultra-tech rounds push pretty high penetration levels, too. An raw damage cutoff (“less than 5d,” for example) is entirely arbitrary as well. We could draw a line using a “the overall cartridge must be 40mm long or smaller” guideline, and that might work. The 5.7x28mm makes for long magazines and grips for a pistol, fits well into the top-mounted magazine of the P90, and is about 41mm. The 10mm auto is 32mm long, and the monster .50AE is 41mm as well. Both of those make for unwieldly pistol grips for regular folks, so backing it down to an overall length in the 35-40mm range will work out. This cutoff works for human-sized folks, of course. Of course, that’s not a stat that’s used in GURPS, but it doesn’t have to be. I will use it when doing the “below the waterline” fiddling. For that matter, I’m going to restrict the cartridge width to about 10mm as well. That means the H&K UMP would bizarrely not qualify as a SMG/PDW using my criteria, but take these restrictions as guidelines rather than rules. Further, I’m going to restrict the chamber pressure as well to 50,000psi. This is a 10% increase over the actual pressure of the 5.7x28mm, and only slightly more than the 45,000psi we allowed our TL9 10mm pistol round. Both SMGs and PDWs are really the same thing: they bridge the gap between a handgun and an assault cartridge, are optimized for two-handed shoulder-arm use rather than two-handed or one-handed pistol-style employment, and are designed to be a tetch discreet and handy for carry. In many cases, the use of SMG-type or PDW-type weapons may be obviated by employing a carbine. Where the SMG/PDW might find favor is when the weapon design would really be best served with something less than the full-power military rifle cartridge that would be in common deployment. So you might give folks a very short carbine, but since the round in question is designed for full-length barrels (say, 400-500mm), much of the propellant charge is going into the air, not pushing the bullet. That’s loud, blinding, and inefficient. There are some great imaginative folks out there, putting together solid models of potential compact designs. Check out this compilation of nifty designs: click the picture to go to the collection. The description here is limited, and giving the design to SWAT teams threw me for a bit. 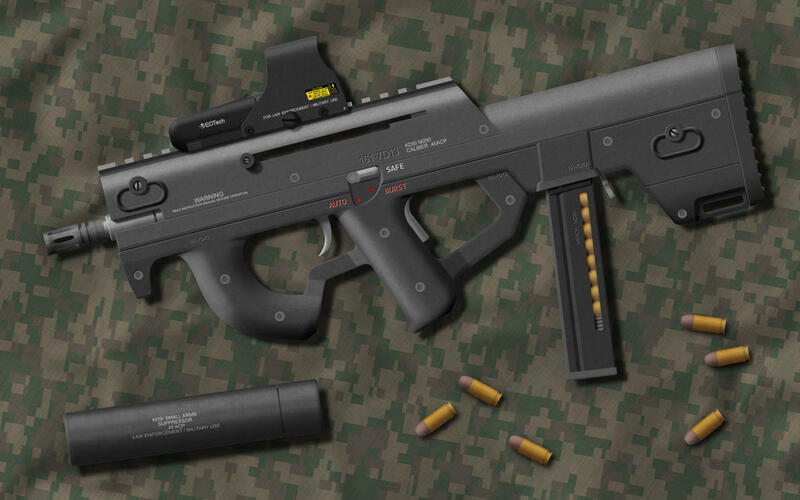 But this weapon is basically an up-calibered version of the Steyr TMP, which itself is a 9mm SMG. So we’re going to get a weapon with very small bulk (pistol-sized), a short barrel, but a problematic pistol grip magazine if you give it more than the 15 or so shots you can squeeze into a pistol-grip magazine. Still, perhaps this can be solved with a bit of supply. The first magazine, the one that is in the weapon in holster, is 15 rounds. Backup magazines are 30 rounds. So you get the convenience of a side-arm carry, but the ammo capacity of extended magazines once the first one is empty. Issue with that? Why provide the smaller number of rounds first? Nah. Forget that. One way to solve this is, well, the Chinese already went and did it. The CS/LS06, with a helical magazine mounted on top of the weapon. Pretty slick, eh? That 9mm helical magazine holds 50 rounds, and since the overall length of the 9mm is the same as our notional 10mmCLP, a slightly larger diameter helix will allow the full 50 rounds to be loaded. Make it a folding instead of a fixed foregrip and you have a, well, it’s still probably Bulk -3 instead of -2. I don’t see a way around that. Still, it could be very light, worn as a sidearm, and gives 50 rounds of capacity. The light-weight 10mm rounds, at only 135gr projectile plus a bit more for propellant will weigh about 1.1 to 1.3 lbs per magazine, but if the usual handgun load is one in the gun and three spares, that’s going to be roughly the same number of bullets (50-60). If you’re talking SMG 30-round mags, or 25 for UMP types, then two helices will give you what you need. The rest is just looking at a 250mm barrel, probably giving about 4d pi+ damage. The weapon is usually used in two hands, but at 1.5xST (ST 14) can be handled in one – loaded with normal ammo, the beast weighs almost five pounds. Now let’s build a proper SMG for the 10mm CLP. Let’s keep the idea of a 10mm common ammo platform, but we’ll assume that this weapon is configured more like the P90 than not. 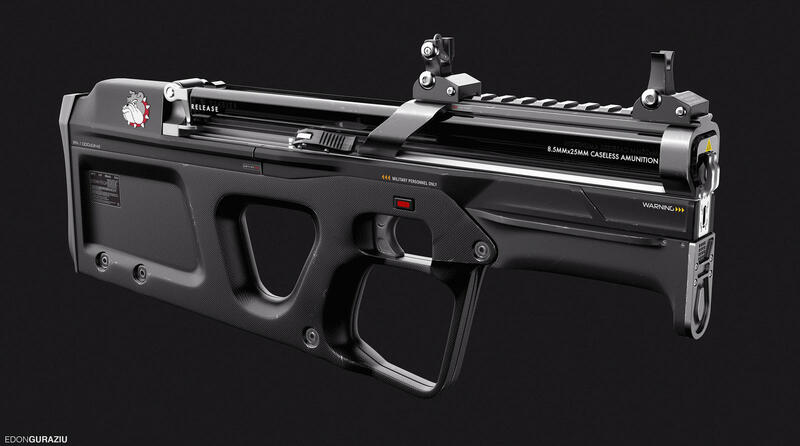 A pseudo bullpup configuration with a top-mounted magazine and either combustible case or caseless ammunition. The magazine can hold 30 shots and be 300mm long (11.8″) in a single-stack configuration, or go double-stack (and probably 20mm wide, and 40mm long) and get 45 shots or so. Heavy magazine due to the physical bulk of the rounds, but you get a lot of shots there. You could potentially also use some of the ideas from the G11 project, and put a giant block of cartridges behind the firing hand, but for now, we’ll skip that. We’ll stick a 265mm barrel on it, just like the P90, which pushes the bullets to a base damage of 4d+1 pi+. This is a 9g (135gr) projectile that is likely solid copper, or close to it. 1/2D for this will be 220yds, max range of 2,125yds. The longer sight radius on this weapon increases the accuracy to equal to that of other similar weapons such as the MP5 and the P90. This fairly generic PDW is a small-caliber clone of the P90 in the Ultra-Tech book, doing slightly more damage as the base round at 4d pi- according to Ultra-Tech, representing likely a 2.2x increase in the energy of the projectile. Since the 5.7x28mm is pretty anemic to begin with, that’s probably a good thing. We’ll ditch the standard round, though, and take our 5.9x30mm CCTAPEX as the basis for this bad boy. So we’ll start with the same basic projectile as the pistol platform I created earlier, and tweak it. This will be special PDW ammunition with a higher pressure and a bit more burn. So we’ll push pressure up to 45,000 psi, and increase the max-pressure to eke the most out of a 95-grain projectile and allow still a short barrel – 210mm (8.3″) for a very compact weapon. That should give 3d-1 (2) pi+ given the prior performance characteristics of the round. Assault-rifle like performance, wounding like a short-barreled carbine (4d ish). 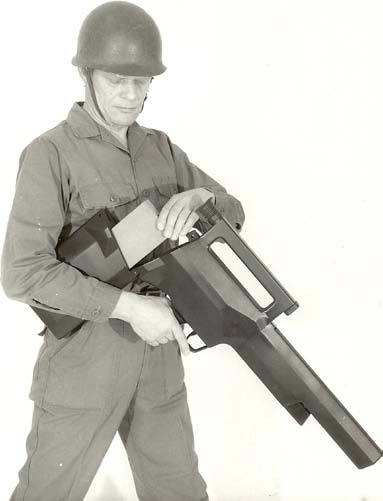 If we go crazy, and borrow the ergonomics and futuristic design of the Thor A1, which was what I used for my Alien Menace campaign, we can fit about 60 rounds in that C-shaped magazine. Expect RoF to be quite high due to the pistol-length rounds, on the order of that of the Glock 18 or Mac-11 – but let’s call it RoF 20 at 1,200 rounds per minute. The downside of this configuration is that the curved magazines will not pack well and may be an ergonomic and reloading nightmare. Still, if we assume a straight magazine of 60 round capacity, it’ll still only be about 11″ long. In the following table, CCTA is combustible case telescoped ammunition, the copper-tungsten equivalent of a “ball” round. It will be less massive, at .014 weight per shot and 1 lb per full magazine. So the shorter-barrel weapon firing copper-tungsten alloy projectiles will have more shots and higher RoF if it’s needed, and be a bit less accurate due to shorter barrel length. I can’t rationalize this one as being as compact as a pistol (Bulk -2). It’s a lighter package – a weapon and 180 rounds of ammo will be 7.3 lbs with the PDW and 9.4 lbs with the 10mm SMG, and three magazines carried instead of 4. The CCTAPX ammo will cost $600 per magazine, though! Ma ke no mistake: this is the M41. I already wrote this one up. Still, let’s focus on Ultra-Tech and the issues with the weapon such as it’s listed. We can drive by the 10mm base capability of the round; this is kinda required to make the M41, so we’ll leave it. The SMG does 3d, just like the heavy pistol, which means it’s been given no credit for extra barrel length. Acc 4 is fine given its size, and it’s heavy – full-sized rifle weight of 8 lbs. Relatively sedate RoF, and shots aren’t crazy, but my prior writeup showed how you can use a quad-stack magazine to actually deliver about 70 shots (and a healthy 3 lbs per magazine). ST is going to be higher due to the weight. The underbarrel shotgun is 18.5mm, which even at TL9 is probably an issue. If we use the likely inflated explosive content of UT at TL10, though, you get into 6dx2(5) for HEMP rounds. Making this an actual shotgun is probably a poor choice, though – a better configuration is probably similar to the OICW concept – long barrel for the payload weapon in a bullpup configuration, shorter barrel for the SMG. So while I do love me some pulse rifle action, more likely is somethinng like the image on the right, with a smaller grenade platform in the 18.5-25mm range and our 10mm mounted underneath – perhaps a helical magazine model can be used as the actual foregrip. At 0.1 to .22 lbs per shot, 5-10 rounds will be 1-2 lbs. 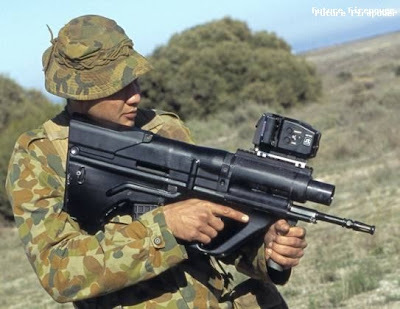 So let’s throw down a 70-shot, 10-payload shot (5 lbs of ammo) in a 5-lb SMG package, with a low-velocity grenade/payload package in 25mm and a 10mm APEX round. It’s the only way to be sure. So we have the big and the little here for SMGs, as covered in the book. What’s missing is a longer-barreled version of a true full-bore SMG. So let’s grab the 7.8x24mm round used in the UT Pistols post, and pop that into a quad-stack magazine. 100 shots is not too much to ask here. With a 300mm barrel, bullpup configuration, you’re looking at a weapon perhaps 18″ long, and a folding or extendable stock for shoulder-shooting comfort. It’ll do about 3d pi damage at the base case, 250yd 1/2D range, and a max of 2,125yds. RoF is going to be 12-15, and each magazine will weigh about 1.7 lbs. The base weapon need not be terribly heavy, either, maybe 3.5 lbs. So that wraps up the SMG/PDW category. Next up: rifles and carbines! The most useful thing and which wasn’t discussed (probably taking it as given) is that there are no RCL 3 weapons here. RCL 3 is useless for rapid-fire weapons. It’s acceptable to a certain degree in pistols as it only means you won’t usually fire above ROF 1. The RCL 3 seen in some UT weapons is probably an edition conversion artifact. They are fairly straight ports of weapons which were RCL -2 in 3e but RCL was different in 3e and -2 was not crippling there. RCL 3 is different in 4e. A RCL 2 SMG is welcome for use of HEMP at TL10. You’ll run into high RCL issues when doing the 10mm Storm Carbine.